A 9-year-old male golden retriever presented for evaluation of persistent and slowly progressive submandibular and prescapular lymphadenopathy. Peripheral blood was submitted to IDEXX for a CBC. Fine needle aspirate samples for cytology were collected from both prescapular lymph nodes and the right mandibular lymph node. An aspirate sample from the left prescapular lymph node was also placed in a lymph node aspirate transport tube for flow cytometry. Please review the test results below to come up with your diagnosis. Selected CBC Results from a 9-year-old male golden retriever presented for evaluation of persistent and slowly progressive submandibular and prescapular lymphadenopathy. There is marked leukocytosis with moderate mature neutrophilia, moderate lymphocytosis, and mild monocytosis. The lymphocytes are a heterogeneous population, and some of these are small with clumped chromatin and appear mature and well-differentiated. However, the majority of the lymphocytes are intermediate in size and have oval to slightly irregular nuclear margins with finely stippled chromatin and a scant to moderate amount of pale basophilic cytoplasm. Although these appear mildly atypical, they are not overt blasts. 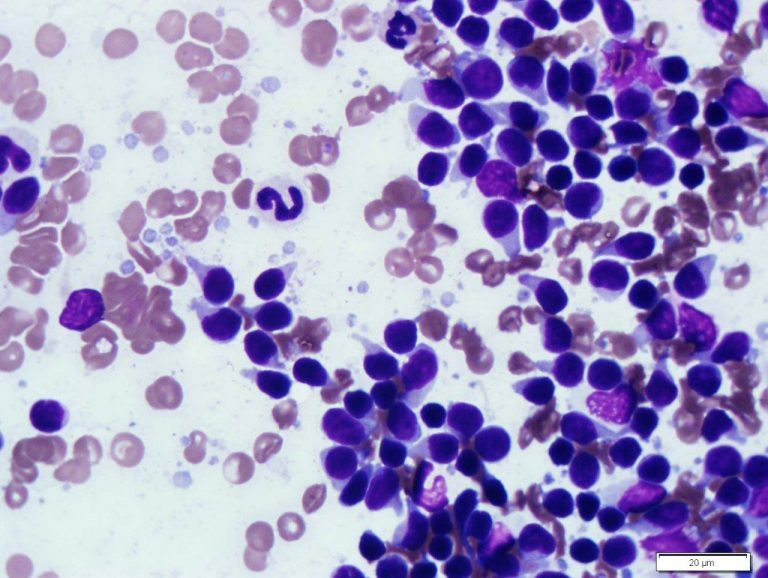 In older dogs, lymphocytosis is most often associated with lymphoproliferative disease (circulating neoplastic cells from small-intermediate cell lymphoma or chronic lymphocytic leukemia). Correlation with the lymph node cytology and flow cytometry results is recommended. The mild thrombocytosis is a non-specific finding and may be secondary to chronic inflammation or lymphoproliferative disease. The red blood cell parameters are within reference intervals. The slides from all three lymph nodes have a similar appearance on cytology. The slides are highly cellular. There is a monomorphic population of intermediate-sized lymphocytes. These have oval to slightly irregular nuclear margins with smooth to lightly clumped chromatin, no nucleoli, and a scant to moderate amount of lightly basophilic cytoplasm. Many of the cells have distorted cytoplasmic borders, and these cells have a “hand mirror” appearance. Only very rare mitotic figures are seen. There are also lower numbers of small, well-differentiated lymphocytes, occasional large lymphocytes with multiple prominent nucleoli, and low numbers of nondegenerate neutrophils. 4% of the cells brightly express CD21 (B-cell marker) without expression of CD5, and these are thought to be normal B cells. 40% of the cells have weak expression of CD21 and coexpress CD5 brightly. Only 19% of the lymphocytes express CD45 (pan leukocyte marker), which is typically expressed on lymphocytes. The diagnosis is T-cell lymphoma with an aberrant phenotype consistent with T-zone lymphoma. The lymphocytes in this patient have an aberrant phenotype. The majority of the lymphocytes retain expression of pan T-cell markers CD3 and CD5, but most of the cells in this patient of these do not express T helper cell (CD4) or cytotoxic T-cell (CD8) markers, as would be expected for normal canine T-cells. The loss of CD45 expression, which would be expected in normal T- lymphocytes as well, provides further evidence of a neoplastic origin for the cells. This immunophenotype has been reported in dogs with T-zone lymphoma, which is a low grade lymphoma that often has associated lymphocytosis. This type of lymphoma is typically indolent and slowly progressive, which is consistent with the reported clinical history. This dog also had excisional biopsy of a lymph node with histopathology and immunohistochemistry, which confirmed the diagnosis of T-zone lymphoma. This patient was doing well with persistent lymphocytosis and mild to moderate lymphadenopathy two years after diagnosis with intermittent treatment with prednisone. Although high grade T-cell lymphomas in dogs typically have a rapidly progressive clinical course, T-zone lymphoma has indolent behavior. Dogs with T-zone lymphoma may have static or slowly progressive lymphadenopathy over months or years, with reported median survival times of 21 months or more. It is typically seen in older dogs with a median age of 10 years at diagnosis. Lymphocytosis is present in the majority of affected dogs, and is usually mild to moderate. In the US, Golden Retrievers are the most common breed diagnosed with T-zone lymphoma. On cytology, the neoplastic lymphocytes in T-zone lymphoma are typically intermediate in size, lack nucleoli, and have a moderate amount of cytoplasm that may have distorted cytoplasmic borders with a hand mirror appearance. When the cell population in the lymph node aspirate is still mixed with small, nonneoplastic lymphocytes from the residual normal lymphoid population of the lymph node or the slides are thick and the cells do not spread well to evaluate, this can be difficult to differentiate from lymphoid hyperplasia on cytology. 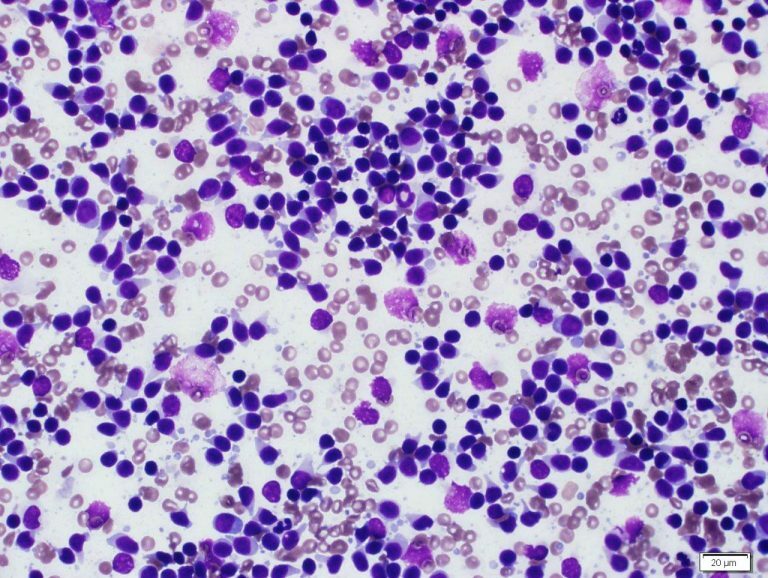 Although excisional biopsy of a lymph node with histopathology is needed to diagnose most types of low grade lymphoma, T-zone lymphoma has a unique aberrant phenotype on flow cytometry that can help identify this type of lymphoma in conjunction with the clinical history, cytology and the CBC findings. D.M. Seelig, P. Avery, T. Webb, J. Yoshimoto, J. Bromberek, E.J. Ehrhart, and A.C. Avery. Canine T-zone Lymphoma: Unique Immunophenotypic Features, Outcome, and Population Characteristics. JVIM 28(3): 878-886. May/June 2014. Martini, L. Marconato, A. Poggi, F. Riondato, L. Aresu, M. Cozzi and S. Comazzi. Canine small clear/T-zone lymphoma: clinical presentation and outcome in a retrospective case series. Vet Comp Oncol. 3 June 2015. 14(S1), 117–125.